Surrounded by quiet countryside of woods, river valleys and sleepy villages, this pretty cottage stands in a large colourful garden with its own swimming-pool and enjoys views of beautiful sunsets. 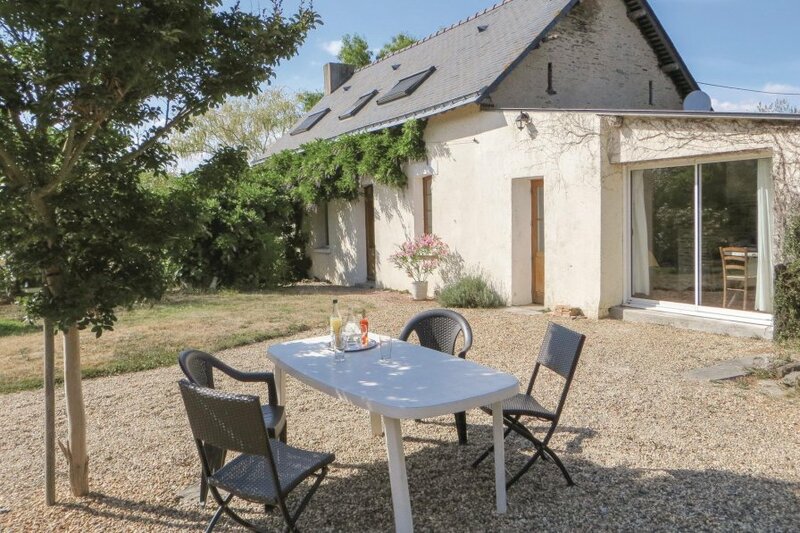 Surrounded by quiet countryside of woods, river valleys and sleepy villages, this pretty cottage stands in a large colourful garden with its own swimming-pool and enjoys views of beautiful sunsets. Carefully restored, it boasts a spacious comfortable living-room with piano, original terracotta floor and beamed ceiling while outside is ample space for outdoor meals, relaxation and birdwatching. You will find a piano in the living room. This peaceful area offers two nearby activities: Fishing in a forest lake (5 miles ) and swimming at 'Le Louroux beach', a local family playground with its large pond (3 miles away). Ideally situated for exploring the many historic châteaux in the region, it is only 15 minutes away from rhe river Loire, local vineyards (wine-tasting) and restaurants (local specialities). Cyclists can follow the river course along the 'Loire à vélo' itinerary, a great way to explore the region. It is within easy reach of the famous estates of Muscadet and Saumur. Angers, the nearest city (20 minutes) at the confluence of three rivers is also worth a visit, both as a historic site and an attractive modern town. Bedroom 2 is a tandem room with its own shower. This villa is made from brick or stone. The agent has rated it as a three star property so it is a well-kept villa, equipped with standard furniture. It is also good value for money. This villa has a private pool and is located in Val d’Erdre-Auxence. It is set in a good location: there is a restaurant 3km away.